What a Difference a Thread Makes! The thread I chose was a Sulky Blendables-a 30 wt. mercerized Egyptian cotton-that repeats colors in a random pattern every five inches. So, take a look at my little experiment. 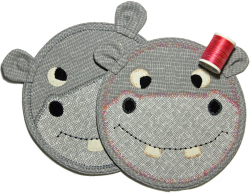 On the left is a sample using matching thread and on the right one using Blendables. I like the added color and personality it brings to the faces. The examples are “critters” from our Zoo Pals and BarnYard Petz patterns. 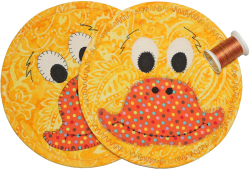 And...speaking of new patterns, last month we introduced our 8” mug rug BarnYard Petz pattern which includes Cluckerz and this month we are releasing the Zoo Pals pattern home for the cute Hippiez the Hippo and friends. And...we know you'll like this, since both patterns make ideal 3-hour classes in your shop, we provide the kit requirements for each. Just click here to be taken to the page on our web site to download one or both.